View and approve an assembled prototype before selection of finishes, glass tint, or glass coating colors. In color selection, consider potential dirt accumulation and glass cup marks in vented shadow box cavities. Don’t mechanically “fix” the perimeter of the back pan; allow it to “float” to avoid excessive buckling or rippling. There are many acceptable back pan attachment details, which should be reviewed on a system-specific basis. Stiffen back pans as necessary to prevent “oil canning” or excessive deflection under load. Isolate the perimeter frame and back pan from the cavity when thermal performance is critical, in either hot climate or cold climate applications. Don’t use solvent release sealants like butyls, acrylics, or acetoxy-cure silicone within the air cavity. Use neutral cure silicone only. Check the service temperatures of all components used. 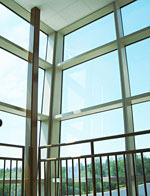 Use only silicone, SCR or EDPM glazing gaskets in the air cavity, or conduct application-specific compatibility tests. Carefully weigh the pros and cons of venting shadow box cavities to the exterior, and specify the desired design characteristics. Whether vented or un-vented, shadow boxes should not be expected to remain condensation- free under extreme exterior environmental conditions, or during shipping. Seal framing members full depth at the cavity perimeter in “shadow box” applications. Use only silicone secondary seals in insulating glass units for shadow box conditions. Always maintain a cavity air seal to the interior, whether the cavity is vented to the exterior or un-vented. Pay special attention to shadow box perimeter details at framing, inserts, pocket fillers, etc.